Overall titles will be at stake when the International Ski Federation Cross-Country World Cup season concludes in Québec this weekend. Norway's Therese Johaug has extended her lead in the International Ski Federation (FIS) Cross-Country World Cup distance standings after winning today in Falun. Olympic champion Stina Nilsson of Sweden has extended her lead in the International Ski Federation (FIS) Cross-Country sprint World Cup standings after triumphing in today's event in Falun. Norway's Maiken Caspersen Falla will be among the favourites for the women's sprint gold medal when the International Ski Federation Cross-Country World Cup in Falun gets underway tomorrow. Newly-crowned world champion Jarl Magnus Riiber edged Finland's Ilkka Herola in a thrilling sprint finish to take victory at the International Ski Federation Nordic Combined World Cup in Oslo. Sweden and Norway triumphed in the women's and men's classic team sprint events respectively as action concluded at the International Ski Federation Cross-Country World Cup in Lahti. Norway swept the men's and women's sprint freestyle races as Johannes Høsflot Klæbo and Maiken Caspersen Falla claimed victory at the International Ski Federation Cross-Country World Cup in Lahti. Norwegian Therese Johaug continued her strong form since returning from a doping ban as she claimed victory in the women's 10 kilometres classic race at the International Ski Federation (FIS) Cross-Country World Cup in Otepää. Norway secured a classic sprint double as Johannes Høsflot Klæbo and Maiken Caspersen Falla won the men's and women's races respectively at the International Ski Federation Cross-Country World Cup in Otepää in Estonia. Therese Johaug continued to extend her lead at the top of the International Ski Federation (FIS) Cross-Country World Cup, following her return from a doping ban, as the Norwegian won the women’s 10 kilometre event in Davos. Sweden's Olympic champion Stina Nilsson secured sprint victory as the International Ski Federation Cross-Country World Cup season continued in Davos. Davos is the latest stop for skiers as the International Ski Federation (FIS) Cross-Country World Cup season continues. 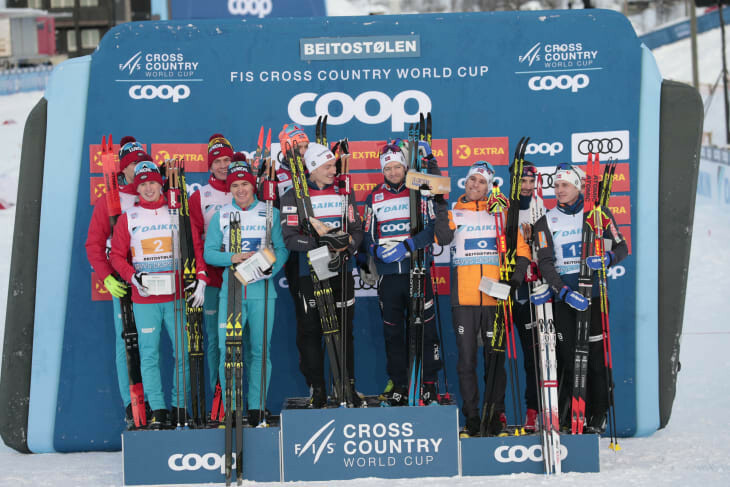 Norway won both the men and women's team relay race at the International Ski Federation (FIS) Cross-Country World Cup event in Beitostølen. Norwegian Therese Johaug will aim to continue her 100 per cent start since returning from a doping ban when she competes at the latest International Ski Federation Cross-Country World Cup event of the season in Beitostølen.